It quickly disappears into a ball of light, setting off an explosion when it reappears. Use reaction commands when it's in light form. It easily resists magic, so don't be shy about using the Keyblade! The Silver Rock (シルバーロック, Shirubā Rokku?) is an Emblem Heartless that is found in Kingdom Hearts II. Bearing close resemblance to its predecessors, a Silver Rock is a type of magic-using Heartless named after its color and a form of music. Despite the name "silver," Silver Rock are the white member of the family. They utilize balls of energy and light as weapons, and can teleport. During its reaction command, Shift Shot, Sora launches the Silver Rock, in its light orb form, at another enemy. After the initial attack, the Silver Rock will begin rushing at Sora for a body slam, using the first attack again every so often. A Silver Rock has a smooth, conical, white body with a Heartless emblem emblazoned on its chest. 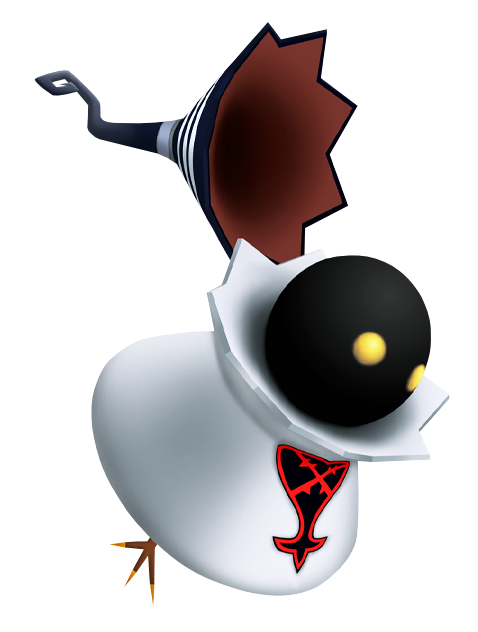 The top of its body flares outward and forms a jagged "collar" below the Heartless's spherical, pitch black head. It also wears a conical, reddish-brown hat with a jagged brim, silver rings decorating it, and a thin, curled tip. Like many Heartless, the Silver Rock has glowing yellow eyes. Its seemingly useless feet sport three small, thin toes. The Silver Rock, like other members of its family of Heartless, has a name comprised of a color and musical term. In this case, the color is silver, though the Heartless itself is more prominently colored white, and the term is rock.